Hello, 10x for you article. can you please tell me exactly what to do? is it possible to use only reverse proxy and delete all port forwarding setting on router? i want DSM and Filestation be accessible from WAN (from external places like hotels, airports and other places where all ports except 80\443 are closed) using reverse proxy. or portforwarding 192.168.2.5 port 5016 (synology dsm) to 443 on my router make the same thing that i want or it is absolutly different things? Hi: you only need one (or two) forward rules on your router: From the external IP to the Synology intenal IP, and to ports 80 and 443 (HTTP and HTTPS). Now you need on the DNS define a name for each service that you want to reverse proxy, for example: dsm.syno.com, audio.syno.com, video.syno.com, and so on. All entries use the same external IP, so, for example: dsm.syno.com points to 187.213.45.90 and also audio.syno.com points to 187.213.45.90, and so on. 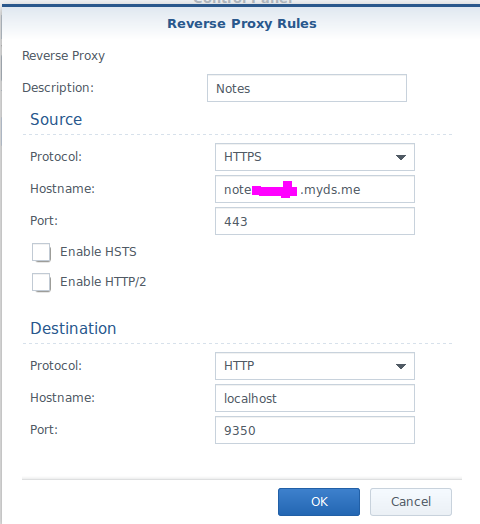 The reverse proxy will receive the request and redirect to the internal synology service based on the domain name, so you must create a rule for reverse proxying the domain name dsm.syno.com to localhost port 5000, another rule to reverse proxy the domain audio.syno.com to localhost port 7700 (for example and so one). So after this configuration the router rules doesn’t need to be modified in any way, just add the domain and IP address on the DNS and create the reverse proxy rule. now i finally get the idea. but it doesnt work for 80\443 using web ui. but i try to use for example 5050 for dsm, reverser proxy to 7000 (filestation), open only 5040 on router and it works. Hi, yes it works for the port 80 and 443 at the web ui. You must define write 80 or 443 on the port box. It’s an UI design error. Just make sure that the domain name is the one specified on the A record DNS. i record a video, if you want i can upload it to youtube- you will see that it doesnt work. but if change 80 or 443 to something else,for example 5040 and my domain, and localhost 5050 – everything works as it should, also i need open 5040 (source\destination) on my router to make it work. if it was 80\443 i need only to open this two ports and use subdomains to work as i want. so it seems like i need to manually edit conf nginx\apache files. Strange. I’m pretty sure that I’m also at the same DSM level as you. I’ve never used the betas. I have the “normal” web station available at the external IP port 443, and also at the same external IP and port 443 the note station as shown above on the screenshots. Ok. Both of your configurations are right but each one are for different scenarios. The first configuration redirects https://test.domain.ru to localhost:5015 and the second configuration redirects https://test.domain.ru:7979 to localhost:5015. In this last case you have to open the port 7979 on the router and forward it to the synology port 7979… On the first case the 443 port isn’t needed to be added to the url since it’s the default https port. Still you need to have a rule forwarding the port 443 from the router to the synology. As I’ve said you only need to open and redirect ports 80 and 443 on the router. Then you can add all the rules to map domains to local ports as your first case, to the internal services. You may have problems testing *inside* from your network, try from outside, for example by mobile phone. Also see my last screenshot that I’ve added to show my full configuration. It works fine and the only thing that I have is a rule on the router forwarding the port 443 from the external router interface to the port 443 of the synology device. what do you think about performance? is it slow or the same for working with files using reverse proxy? maybe apache\nginx need to be configured or some kind of rules on a router? The only way that I see you can change from the HTTP to HTTPS without modifying the nginx configuration files is to create for each site on HTTP a single page that the only content is to redirect to HTTPS. Hi, thanks, Jut put it on the comments, if you want, then all the people can read it with the proper author associated. do you have a solution for roundcube? Many thanks in advance for your answer! One simple solution is to create a site for webmail.mydomain.tld that the only it does is to redirect to the roundcube mail address. Check some of the comments above. Whenever I try to access my via subdomain.domain.com, all i get is dsm login screen – any thoughts? Did you test it outside of your network, for example by using 4G internet on a mobile phone? It seems you are right. I did a small test, and the reverse proxy only works for Synology hosted services… Rather strange. The reverse proxy uses the nginx server while there is also the Apache server that really serves the sites. So nginx is only the frontend. You might want to see my other posts regarding the virtual sites for DSM, and that will work for sure. Thanks for that, seems a bit too involved for me, looks like I could do some real harm to my syno if I got it wrong! This was a very helpful guide! It allowed me to achieve exactly what I wanted, namely, to have packages be accessible as subdomains. Could we reverse proxy photo station? I would like to use https://photo.mydomain.com instead of https://mydomain.com/photo. It might be possible by making available the front-end url photo.mydomain.com and redirecting internally to the photo url path. I have followed your tutorial, FW port 443 to DSM configured, for example, https://notes.mydomain.com to HTTP//: localhost:9350. I get 502 bad gateway. Tried HTTP:// nas_ip;9350 same bad gateway. Any ideas? Thanks for the guide. I followed this as a test to allow access to my Download station on internal port 8000 (http). I have a valid LE cert for my synology.me domain and I can login to the admin console and get a valid cert. If I try to access http://download.mydomain.synology.me, I get a cert error and am required to make an exception in FF to move forward. Do you know how to fix this? I thought the one cert would allow me to certify all subdomains. Seems like synology.me does not support subdomains? I have a dynns.com pro account so I set up *.mydomain.dynns.com and that seems to be working now. The certificate error can be solved by two different ways: The first is on the default certificate, on the Subject Alternate name to add all the required domain names. 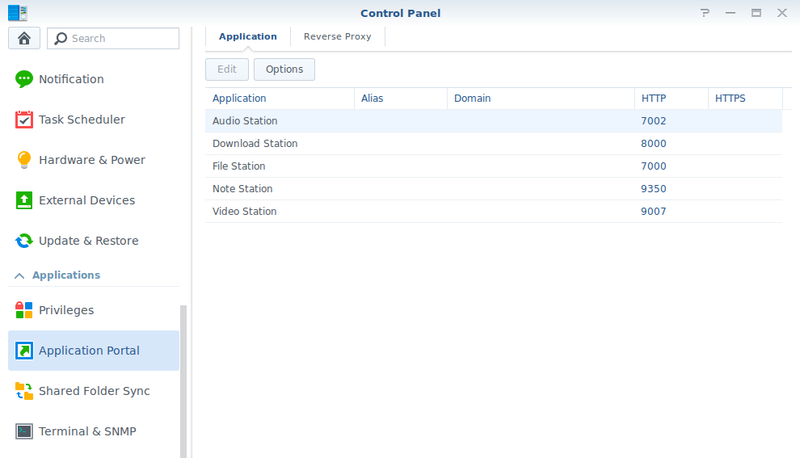 Not sure if the alternate domain name *.synology.me works (with the wildcard), but it is something easy to test. Another way is to add a new certificate specifically for the new site. Just go to Control Panel -> Security -> Certificate and add a new LE certificate. After that, select the certificate, press configure and associate the certificate to the required domain name. This is how I have it configured. By using reverse proxy I can associate a given Synology DSM service to a subdomain, like https://photostation.mydomain.com and https://dsm.mydomain.com, how can I redirect the actual domain (https://mydomain.com) to a custom Web Station website? I’ve tried to do this, but it always keeps redirecting to DSM login. I’ve been using the same method and it works well but I can’t get it working for Surveillance Station. Every time I try to log in using the windows client it fails, am I missing something? Yeah I’ve tried that port, strange how everything else has always worked, might have to contact Synology then.